Christmas time represents many things for many different people – love, family, religion etc. However the one thing that most people associate with Christmas is food! Every year the supermarkets fill their shelves with an abundance of sumptuous looking entrées, desserts and snacks. Traditionally in the UK we serve a large roast dinner on Christmas day – normally a cooked turkey with plenty of vegetables and other dishes such as ‘pigs in blankets’ and stuffing. However it’s not just Turkey that makes an appearance around Christmas time – you’ll often find delicious joints of glazed gammon, chipolata sausages and other meats. With presents to open, family to see and mouths to feed the last thing anyone wants is to worry about how safe the food they’re serving is. This is where we come in. We have two fantastic gadgets that are sure to put your mind at rest this Christmas time. The DOT is an easy to use cooking thermometer that displays both the current temperature and the alarm set temperature. The DOT has a braided lead on the probe meaning you can actually leave the probe inside your meat in the oven. Simply set the desired temperature using the buttons, insert the probe correctly into your meat, pop in the oven (DOT body left outside) and the DOT will beep and the display flash when the temperature is reached. This way you can relax and enjoy time with your family knowing that your meat won’t be under or over cooked! The DOT incorporates a large LCD display and loud 70db audible alarm making it ideal for use when the whole family are round and blasting out Christmas carols. Housed in a durable, water resistant case, the DOT is designed to either sit on a worktop using the fold out stand, or attach to an appliance using the magnetic pads at the rear of the instrument. 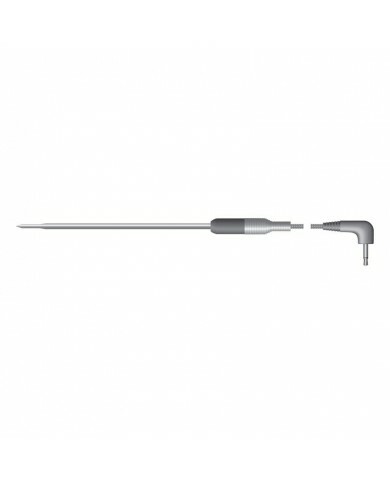 Each unit is supplied with a 114mm penetration probe with a 1.2m stainless steel braided lead. 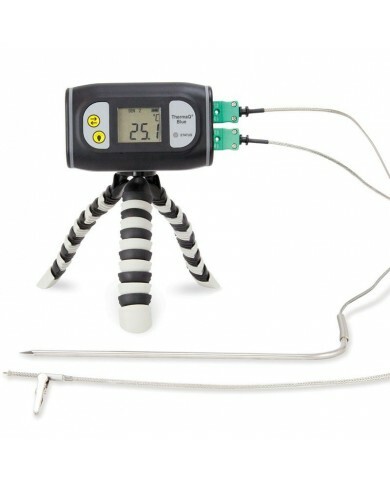 The Thermapen Professional is the UK’s number one selling food thermometer measuring temperature over the range of -49.9 to 299.9 °C. Used by hundreds of thousands of people worldwide ~(including top chefs) it offers a combination of speed, accuracy and convenience of use. All you have to do is simply insert the probe into your joint of meat and you’ll get an accurate temperature reading in just 3 seconds. Using advanced technology the Thermapen 4 includes many innovative features. The patented 360° self-rotating display can be used in any position, in either hand making it truly ambidextrous. The unit also incorporates an intelligent backlit display sensing light levels. The motion sensing sleep mode automatically turns the Thermapen 4 on/off when set down or picked up, maximising the battery life. The Thermapen casing is washable (waterproof to IP66/67) and includes ‘Biomaster’ additive that reduces bacterial growth and the ergonomic rubber seal minimises the risk of food, water or dust settling into the Thermapen casing. Use your Thermapen to check the temperature of everything from meats to sauces and desserts this Christmas. Poultry – 74°C – Insert probe into thickest part of the bird between thigh and breast. Chocolate – The melting point of chocolate is between 30-32°C. Christmas pudding – 71°C – Cooking any hotter than 89°C will cause the sugar in the fruit to caramelise and cause a bitter taste. Homemade custard – Fully cooked custard should not exceed 80°C and it begins setting at 70°C.